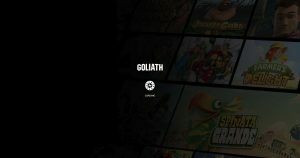 Goliath Casino is licensed by the UK Gambling Commission and the Malta Gaming Authority and offers 17-hour customer support via live chat and telephone. Goliath Casino have done a really good job at creating an easy to use and simple website which offers a smooth and straightforward navigational journey for its users. As soon as you land on the page, everything you want to find is easily accessible from the links at the top of the page, however, there is one minor caveat as whenever you go to a new page, a loading screen pops up, which can get quite annoying. 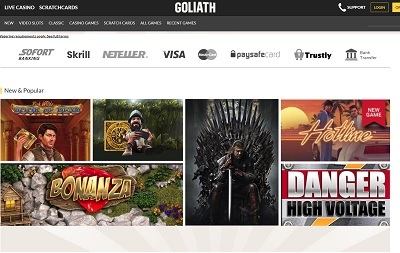 Goliath Casino is home to most of the popular payment methods including Visa, Mastercard, Bank Transfer, Sofort Banking, Trustly, Skrill, Neteller, Giropay, Euteller, Zimpler, EPS, Paysafecard, Instadebt and Entropay. The minimum withdrawal is £10 and the minimum deposit is £10. The maximum withdrawal limit is £500,000 per day. 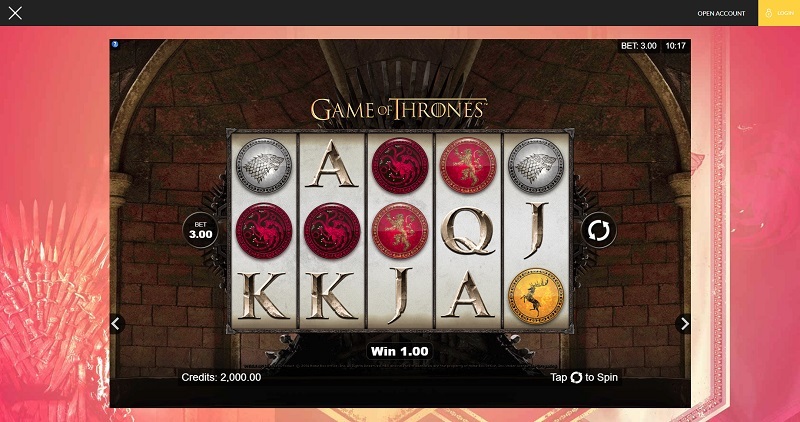 There is no maximum deposit though one can be set. 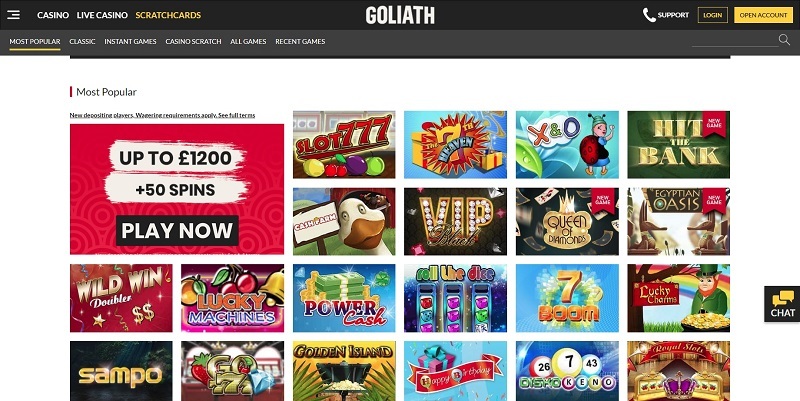 Goliath has a very decent selection of games available including high-paying progressive slots like Mega Fortune and Legend of Loki, though the current jackpot totals aren’t immediately viewable. 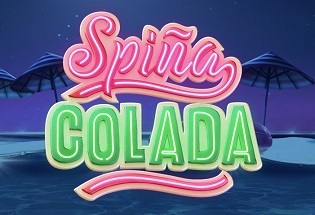 However, the other games are nice and easy to find, like popular slot titles Starburst and Rainbow riches, all the traditional table classics, fun instant-win games, plus live casino tables on baccarat, blackjack and roulette. A fine choice! Goliath by name, Goliath by nature? Pretty much. This casino has certainly hit the ground running, and created a casino of a very high standard. 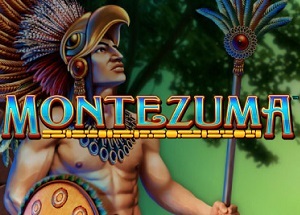 With a beautifully crafted navigational journey, a mammoth of excellent games, superb banking methods, and a decent customer support team; there’s very little letting this casino down. Sure it might be a bit rough around the edges in parts, but from such a new player in the game that is to be expected. Even if some might not believe Goliath Casino is a Goliath just yet, it’s well on its way to becoming one.